Carpet dealers believe that the “early bird catches the best worms” so they are known to wake up earlier than most people. If he has not too much to do on a particular day he would wake up around 4am and travel to the countryside to different towns and villages to visit the other bazaars around to look for carpets that they received recently. This takes a few hours of his day. If the carpet dealer has some business to attend to in the bazaar, the first course of action for the day is to visit the carpet cleaning factories that are generally located outside the city, to oversee the carpets they are cleaning for him to discuss the cleaning processes and give some advice. These are usually the carpet dealers that export carpets. By 9am he goes to his shop in the bazaar to follow up on his orders and transactions and catch up on some other admin work to be done. This is his time to deal with customers (mostly tourists), redecorate his shop and visiting or being visited by other carpet dealers in the bazaar. One of the biggest assets for carpet dealers are the middle men dealers that use motorbikes to go to the houses that wants to sell their old carpets to bring it to the carpet dealers in the bazaar. These middle men receive some commission for their efforts, which in big volumes cover their living costs. The other thing that is custom in Iran is that some buyers from overseas prefer to deal with one carpet dealer only that they built a relationship with and that carpet dealer may not always have the carpets they want, so he needs to act on behalf of the bazaar and take the customer to different carpet dealers and introduce and negotiate on behalf of the customer. He then will take all the chosen carpets to his shop and warehouse as a collecting point, to finish the transaction and export the carpets with all its documents and wash and repair the carpets (if necessary). The overseas customer does not need to deal with 20 people but only with one carpet dealer who he pays and who will then pay each carpet dealer involved their agreed fee. Lots of times the cleaning factories have some repairmen that do general repairs like fringes and sides for the carpets but there are many professional repairmen residing in the bazaar for more complicated repairs and the carpet dealer needs to supervise and negotiate with these repairmen while he is in the bazaar for that day. It is tradition to support the restaurants and kitchen houses in bazaar for lunch especially if you have some visitors from oversees or other friends or other carpet dealers from other cities. Some of these restaurants are over 100 years old and it is very difficult not to be tempted by the smell of their food. The tunnel ways of the bazaar is a perfect transportation for the smells. Sometimes in the afternoon after the normal routine of each dealer in their shops the afternoon is dedicated to some discussions with other carpet dealers in the bazaar especially if there is a special carpet that came to one of them and the owner is not sure about its origin or the value thereof. It is custom that carpet dealers will make deals with carpets between themselves if their morning didn’t bring a lot of business because they believe that carpets must be moved, even if it is between themselves. Usually by 2 or 3 o’clock the bazaar closes for the day and the carpet dealer goes home to spend time with his family. After a little afternoon siesta the carpet dealer goes to his carpet shop that he has in other parts of Tehran, usually the north. These shops are for local customers. Iranian people always support carpet dealers in central or north of Tehran for their own consumption. The shop is usually open until 10pm at night. Tehran is a busy city with around 20 million people so all shops stay open till very late. Our very own Rugdealer had a shop in the north of Tehran which he closed 11pm at night. 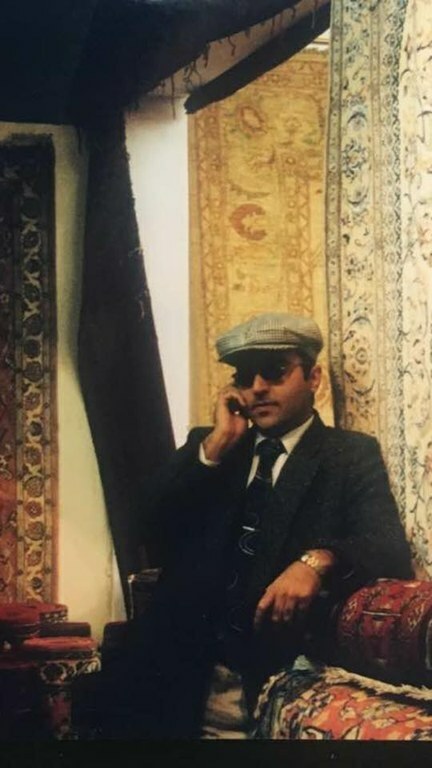 This is a normal day of a carpet dealer in Iran but there are many more things a carpet dealer should look after, such as visiting the custom duties offices to release his goods or managing the shipment, visiting carpet exhibitions and having a stand to manage in the more modern set up, or his local and overseas trips to find carpets and customers.